In our post-Cold War society, economic sanctions have become one of the defining features of the political landscape. Since the early 1990s, the US, Europe and other developed economies have employed sanctions on other nations more than 500 times, seeking to assert their influence on the global stage without resorting to military interventions. From nuclear non-proliferation to the promotion of fundamental human rights, the political goals behind such sanctions are diverse and ambitious, while the measures themselves can take many forms. And yet, though sanctions are often intended to serve as a peaceful alternative to military action, their use is not without controversy. As the comprehensive trade sanctions on Iraq came to dominate newspaper headlines throughout the 90s, the humanitarian impact of the embargo became hard to ignore. The economic stranglehold of the stringent sanctions saw Iraqi children fall victim to malnutrition and prolonged suffering, while a lack of medical supplies and a shortage of clean water led to one of the worst humanitarian crises in modern history. For many academics, diplomats and activists, the Iraq embargo shone a light on the ethical cost of sanctions, generating widespread caution concerning the future use of such comprehensive measures. Ethics aside, however, the proliferation of sanctions cases over the past two decades has also sparked extensive academic debate over their effectiveness as a tool in international diplomacy. In terms of changing behaviour, sanctions have a poor track record, registering a modest 20-30 percent success rate at best. With the US currently extending economic measures against both Russia and North Korea, sanctions are again being debated. As they continue to shape 21st-century foreign policy, it is high time to reflect on both the effectiveness and the ethics of this frequently employed policy tool. The very first case of sanctions as we now know them occurred some 2,400 years ago, when ancient Athens declared a trade embargo on neighbouring Megara, essentially strangling the city’s economy. After that, sanctions were used sparingly until the 20th century. In 1966, the United Nations Security Council took a historic step by imposing its first set of comprehensive sanctions in its 21-year existence. The measures, which were enforced in an effort to undermine Ian Smith’s white supremacist regime in Rhodesia, were soon followed by another set of comprehensive UN sanctions, this time enforced in 1977, in response to South Africa’s apartheid system. Despite these noteworthy cases, the use of sanctions remained limited in the decades that followed, partially due to the tense geopolitical climate during the Cold War; if the US had imposed sanctions on a nation during that time, the affected country could have turned to the USSR for trade, rendering the measures worse than useless. By 1991, however, the standoff between the superpowers had cooled, and the two nations began working together on international peacekeeping. Following the end of the Cold War, the sanctions imposed by the UN Security Council largely took the form of far-reaching trade embargoes – the same ‘comprehensive’ sanctions referred to previously. As the link between such sanctions and immense civilian suffering became increasingly unavoidable, however, the new millennium saw targeted measures emerge as an alternative to the all-encompassing sanctions of the past. These ‘smart’ sanctions – the likes of which are now in use against Russia – are specifically aimed at high-profile individuals or powerful groups within a targeted country in an effort to reduce the collateral damage and suffering inflicted on vulnerable civilian groups. Despite their widespread use on the international stage, economic sanctions are largely ineffective in achieving their objectives. According to leading empirical analyses, between 1915 and 2006, comprehensive sanctions were successful, at best, just 30 percent of the time. What’s more, data has shown that the longer sanctions are in place, the less likely they are to be effective, as the targeted state tends to adapt to its new economic circumstances instead of changing its behaviour. But this is not to say sanctions are completely ineffective: in the past half-century, such measures have proved successful in peacefully resolving a number of high-stake political issues. For example, economic sanctions played a crucial role in bringing Iran to the negotiating table over its nuclear ambitions. After 30 years of disruptions to the country’s trade levels, oil production and economic performance, the UN lifted its sanctions on the nation in January 2016, having successfully convinced the Iranian leadership to comply with limits to its uranium enrichment programme. While the Gadaffi regime initially refused to cooperate, years of pressure from the US and the UN eventually saw the Libyan leader hand over the suspects for trial, in addition to renouncing the nation’s weapons of mass destruction and ending its support for terrorist activities. In our globalised world, nations are no longer required to be self-sufficient, and are able to profit from a wealth of different trade avenues. As one market closes with the imposition of sanctions, globalisation means the targeted nation can simply shift its economic focus to new markets and trading partners, bypassing sanctions and maintaining a healthy level of trade. This issue of non-participation has largely undercut the current western sanctions imposed on Russia, as the nation remains free to trade with some of Asia’s largest economies. Thanks to these burgeoning Asian trade partnerships, Russia has effectively created an economic bulwark against western action. Aside from this question of effectiveness, a significant ethical debate also surrounds the use of economic sanctions. As history has shown, such measures can have unintended, catastrophic consequences, often creating widespread suffering among the populace of a targeted state. Even when sanctions are employed in an effort to discourage human rights abuse, their severe humanitarian impact can in fact cause further harm to the vulnerable populations they originally set out to protect. The most frequently cited example of sanctions-related suffering is the aforementioned comprehensive embargo imposed on Iraq from 1990 to 2003. Four days after Iraq’s invasion of Kuwait, the UN Security Council put in place a near-total financial and trade embargo on the nation, which, over the course of the following decade, would come to profoundly impact the daily lives of all citizens. Prior to the embargo, Iraq had relied on imports for two thirds of its food supply. With this source suddenly cut off, the price of basic commodities rose by a staggering 1,000 percent between 1990 and 1995, leading to widespread malnutrition and starvation, particularly among children. Infant mortality increased 150 percent, according to a report by Save the Children, with researchers estimating that between 670,000 and 880,000 children under five died as a result of the impoverished conditions caused by the sanctions. During the Gulf War, almost all of Iraq’s essential infrastructure was bombed by a US-led coalition, leaving the country without water treatment plants or sewage treatment facilities, prompting extended outbreaks of cholera and typhoid. While analysts and policymakers have attempted to minimise the humanitarian impact of sanctions by shifting towards targeted measures, there is evidence to suggest sanctions may still exacerbate suffering in some targeted nations today. Although North Korea’s food situation has improved since the devastating famine of the 1990s, more than 70 percent of the population remains food insecure, with just 20 percent of the nation’s terrain serving as arable land. As trade sanctions and Pyongyang’s restrictions on aid prolong food insecurity in the nation, some 300,000 North Koreans have fled into north-eastern China in recent years, looking to escape years of drought, hardship and famine. Due to the isolationist nature of the secretive state, it is difficult to quantify the full effect sanctions are having, although we can assume they are at least relatively effective at limiting the net transfer of resources to North Korea. Sadly, those who are likely to suffer most from this shortage of resources are those who have already been victimised by songbun, the regime’s stringent political classification system. Just as the comprehensive economic sanctions against North Korea may be exacerbating the already significant hardships suffered by its vulnerable citizens, targeted measures can also have an equally unintended negative impact. In 2010, the US ratified the Dodd-Frank Act which, in addition to establishing enhanced Wall Street regulation, discouraged companies from sourcing ‘conflict minerals’ from the Democratic Republic of the Congo. While motivated by humanitarian concerns, the US’ attempts to undermine this bloody industry have ultimately harmed many innocent Congolese citizens. According to a recent UN report, the de facto boycott on Congolese minerals has led to the loss of more than 750,000 jobs in the nation’s mining sector. The loss of income resulting from this mass redundancy has had a severe impact on child health in the nation, with conservative estimates recording a 143 percent increase in infant mortality. Despite an international shift away from comprehensive sanctions, this Congolese suffering indicates targeted measures are still not free from ethical quandaries. 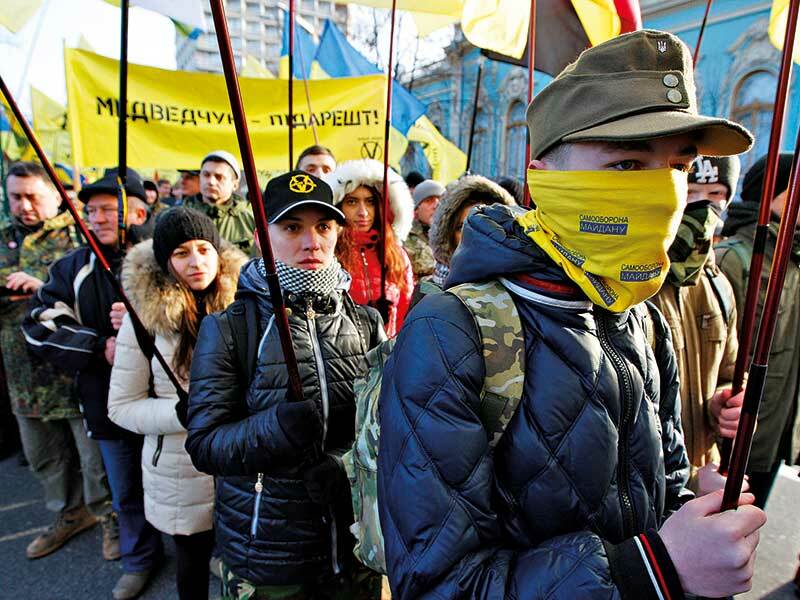 In mid-2014, the beginning of an undeclared war in eastern Ukraine saw economic sanctions rise to the top of the international political agenda. The Kremlin’s annexation of Crimea and the downing of Malaysia Airlines Flight 17 triggered a wave of EU and US sanctions specifically aimed at blacklisting influential Russian individuals. These targeted measures, which remain in place today, take aim at key sectors of the Russian economy, including the oil and gas industries, the arms sector and state finances. Many of these key sectors are managed by a network of powerful individuals, each of whom has connections to the upper echelons of Russian Government. 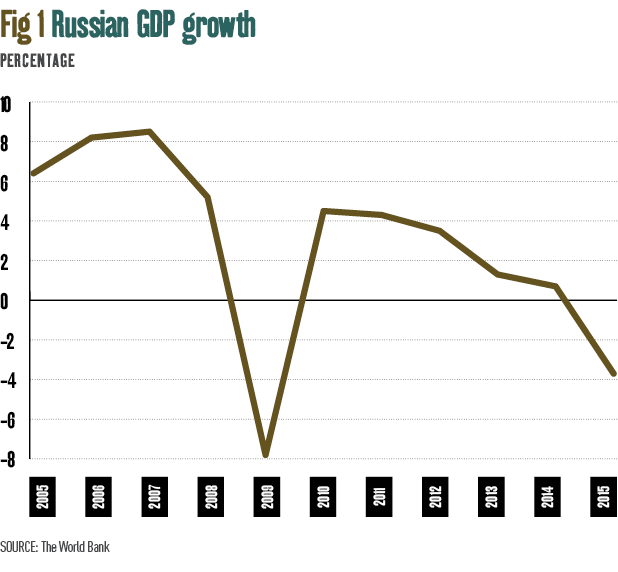 Since the sanctions came into place some three years ago, Russia’s economy has struggled. Between 2014 and 2015, the country’s GDP growth contracted by 3.8 percent (see Fig 1), while inflation accelerated to 15.5 percent. Now more isolated than at any point since the end of the Cold War, the nation has seen an increase in its budget deficit, wide-ranging budget cuts and even noticeable food shortages. While these meat and dairy deficits can be attributed to limits on imports, many experts believe the true economic impact of sanctions has been limited, with Russia’s slowdown in actuality stemming from the global drop in oil prices. 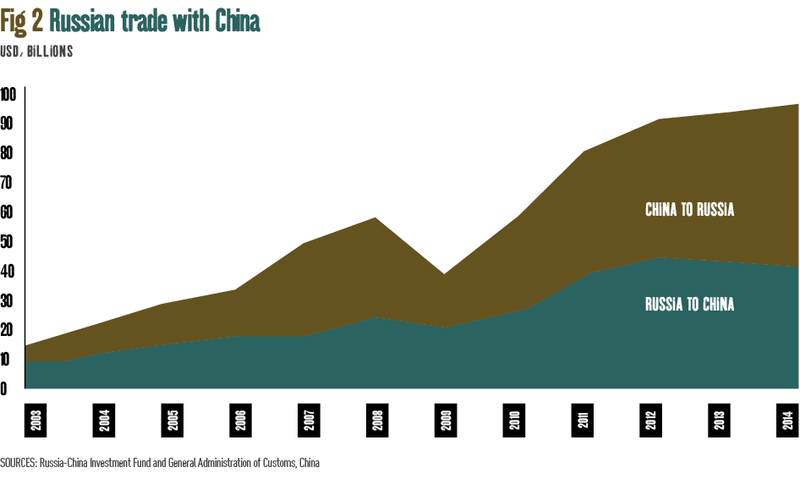 Significantly, western efforts to disrupt Russia’s economic performance have simply brought the nation closer to its eastern neighbours: in an effort to bypass the measures, Russia has been shifting its trade focus towards the fast-growing Asian markets, taking steps to improve its economic and financial links to the rest of the region – to neighbouring China in particular (see Fig 2). Asian non-participation in the sanctions has given Russia a lifeline, with the nation expecting to grow its trade with China to an impressive $200bn by 2020. While sanctions against Russia have now been in place for three years, the Ukrainian crisis is far from resolved. With Russia seemingly unwilling to change its political stance, some sanctions-compliant nations are beginning to question whether the measures are worthwhile. For several countries in western Europe, the sanctions have been a double-edged sword, proving particularly counterproductive in the midst of the ongoing eurozone crisis. Russia is the European Union’s third largest commercial partner, and the EU, reciprocally, is Russia’s chief trade partner, accounting for almost 41 percent of the nation’s trade prior to the sanctions. In 2012, before the Ukrainian crisis began, the EU exported a record €267.5bn ($285bn) of goods to Russia, after years of carefully fostering close economic ties with the country. With sanctions now hurting both sides, divisions are growing in Europe over whether to uphold the stringent measures. While Germany and the UK wish to maintain a hard line on Russia, other countries, including Greece, Spain, Italy and Cyprus, advocate lifting the sanctions. As the situation in eastern Ukraine approaches an apparent deadlock, sanctions are proving to be a significant point of contention in what is an increasingly divided EU. On the other side of the Atlantic, however, President Donald Trump’s unconventional attitude towards Russia has fuelled concerns he may well use executive orders to lift US sanctions, against the wishes of many within his own Republican Party. While such a move could prove costly to the newly inaugurated president, his first months in office have shown he is by no means afraid of ruffling a few feathers. An apparent sanctions sceptic, Trump stands at the opposite end of the scale from former president and leading sanctions proponent Woodrow Wilson. He said in 1919: “Apply this economic, peaceful, silent, deadly remedy, and there will be no need for force.” The true tragedy of this assertion is just how deadly sanctions have turned out to be. How powerful is Donald Trump?